PAX Australia happened a couple weekends ago, and I had my first experience on a panel. I was invited by Leigh Harris of MCV and Flat Earth Games, and alongside James O’Connor and Dan Wilks we discussed the place, purpose and cultural standing of video game reviews. I took a little while to warm up – there was a lot of reviewer specific stuff before we got to talk on the issue from a dev’s point of view, but by the end I was having a great time. Supposedly all the panels were recorded by the PAX crew for ‘archival purposes’, but as yet these don’t seem to have come to light. If they do, I’ll update this post to reflect that. In the meantime, my view! This month I had my first article published in Australia’s PC Powerplay magazine. They were looking for game developers to share stories about actually making games, so I wrote a piece titled ‘Going Gold’. It covered my experiences in the final weeks of L.A. Noire’s development. The pressure, the stress… and the boredom. Maybe one day it will be available online, but for now, go find a copy of PC Powerplay! “Great heroes carry the journey’s burdens, not on their shoulders, but in their hearts.” So begins the debut trailer for League of Geeks’ Armello. Stirring music builds. Next, a bloodied sword. Then a wolf stands upright, wielding the weapon, and I’m immediately transported to my childhood love of the universe of Redwall. The trailer only gets better and by the end, I’m desperate for a chance to play the game. Unfortunately, we will be waiting a while to see anything more, but I was fortunate enough to be shown the trailer by one of its creators – Trent Kusters – and to interview him afterwards. 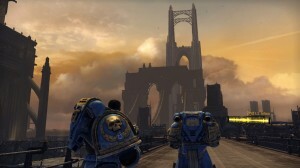 “In the grim darkness of the far future, there is only war.” I first read that phrase many years ago, and dreamed about seeing it in videogames almost from the first moment. Relic’s Dawn of War series was the first time I felt a game really captured the essence of that grim, distant universe. In Space Marine they have done it again, from a much more intimate angle. Regardless of what else I write, Space Marine should be considered a success. It does a spectacular job of rendering that world, and the role of a space marine in it. Everything is at once familiar and different: seen in a new way. I play this game and remember old White Dwarf magazines, unpainted (and very poorly painted) miniatures and battles lost and won. More recently I remember epic games of Dawn of War. Everything is perfectly recreated, and we are thrown into the middle of it all, looking up at the roofs of incredible gothic buildings, instead of down from above as a god. Last week I was lucky enough to speak at the AltDev blog’s student conference. I spoke on the track titled “A Day in The Life”, about my experiences as a generalist Game Designer working on L.A. Noire. It was great fun, even if it was a little odd just talking to my screen in an empty room!